As I keep saying, we will eventually be leaving Summerside, but in the meantime, we’ve still been having lots of fun! Yesterday was a great day for boats coming into the marina – there are some huge boats docked and Dennis is enjoying talking to everyone – a whole new set of people for him to tell his stories to! One of the boats is really quite big and its anchor goes right over the dock, so I had to take a picture of Dennis underneath it. I was hoping that the anchor was well secured! One of the marina people that we’ve met over the past couple of weeks is a lady who owns a beautiful 42.5 foot Bruce Roberts. She and her husband bought the hull a few years ago and then finished the rest of the boat in their back yard. Due to a change of circumstances, Donna is selling the boat and found a buyer last week. 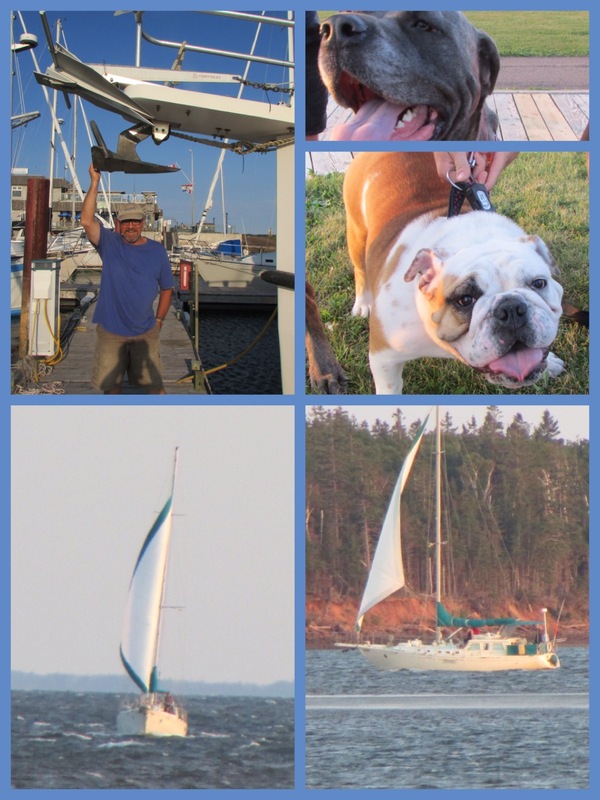 So, in the collage below, you’ll see a couple of pictures of the boat under sail. It is a beautiful boat and the craftsmanship is excellent – I know the new owners (five sisters from Charlottetown) will love it! The other two pictures are of a couple of dogs that are not exactly too beautiful but I couldn’t resist taking their pictures. Since we’ve been here, we have been walking the boardwalk along the ocean every night and have met quite a few people with their dogs. The other bit of news is that at the Summerside music store (it is excellent, by the way) I saw some really interesting instruments in the store and asked the clerk what they were. She took one down (it is called a Strumstick) and demonstrated how it is played. Here is a video of her demo – she’s really good! So, after some pondering, we bought one (with the instructional CD) and hope to learn how to play it. Someone on the dock asked what it was and I mentioned that I was going to sell my mandolin (it really wasn’t working for me) so he bought it and now I have a strumstick which is relatively easy to play!